IN THE recent tug-of-war over viable methods of waste disposal in India, the Supreme Court ruling ordering hospi- tals with over 50 beds to instal incine- rators, has infuriated the anti-incineration lobby. Activists and scientists from Delhi to Mumbai are up in arms against the installation and use of municipal and hospital incinerators (MIS and HIS), amidst reports that the World Bank ( WB ) is poised to clear a us $180 million loan for India for installing incinerators. 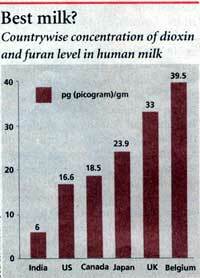 J Studies have indicated that dioxin and furaw (highly toxic substances) levels from HIS exceed those from the MIS. While the total dioxins range from 6.9-80.3 and furans 31.3-119.5 part per billion (ppb) from MIS, they are between 1,155-1,737 and 895-2,140 ppb, respectively, from HIS. "When incinerators have been proved to be an environmental disaster with numerous countries in the West phasing out their usage, it would be a tragedy if India were to set up this high capital-intensive technology, ignoring low cost and environmentally more sound methods of waste disposal," said Paul Connett ofSt Lawrence University, New X ork, while speaking at a recent seminar in Delhi -'Environmental Impacts of Waste Technologies' - organised by the Delhi-based NGO Srishti and the Centre for Environ- mental Law, Worldwide Fund for Nature-India. In Mumbai, numerous voluntary oiganisations are in the process of creating awareness among the people against the ills of incinerators. "Even though Mumbai has landfill sites for only 11 more years, incinerators are no solution," safd Bittu Sehgal, editor of Sanctuary, while speaking to Down To Earth. Adds Connet, "With economic liberalisation and increasing consumerism in India, the problem of waste disposal would increase manifold. The waste disposal industry of the us, an aggressive and corrupting group, would try and cash in on the situation, and force their way into the Indian market". Unconfirmed reports indicate that the WB is finalising the loan under the guise of 'hazardous waste management technology'. India had invited global tenders for incinerators, lending credence to the fears that India is targeted as a suitable and willing dumpyard. Given the extremely high levels of investment, reports suggest that between lQQ-1SQ firms would be involved in running these incinerators for the venture to be pro'fitable. The secrecy which shrouds the deal's pro- ceeds would imply that the government and the industry involved are trying to avoid a public outcry. A study conducted by the Independant Information Office for Environmental Medicine, Strasbourg, Germany, claims that lactating women living in the vicinity of waste incinerators and smelters, showed higher levels of dioxins, furans, poly chlorinated biphenyl and hexachlorobenzene in breast milk. The study revealed that women living at a distance of 0.5-3.5 km from the plants, had 50 per cent higher levels of dioxin and furan concentrations, than those living four to 10 km away. While the levels of dioxins and furans in human milk is lesser in India compared to the West, commissioning of incinerators would definitely put India on par with the West, fear experts.